During the time period when Greece was on the path of gaining independence from the Ottoman Empire, Jews, along with Muslims, suffered due to the Greek revolt. Starting in the second half of the 18th century, Greek rebels and gangsters carried out systemic attacks against both Muslim and Jewish populations. As a result of such acts, the Jews of Egriboz (Chalkis), Istifa (Thebes), and Inebahti (Navpaktos) were completely annihilated. A Greek delegation, which was given the responsibility of activating the ‘Megali Idea’ in 1908, visited Salonica, investigated the economic and social make-up of the city and determined the main principles of the policy that was to be followed in case of a Greek invasion. According to the reports that the delegation prepared, Greeks did not have much of a voice in the economic life of Salonica. Turning this situation around and enabling Greeks to become the real rulers of the city were indispensable for the sake of Greece’s interests. Salonica was to be extricated from being a Turkish and Jewish city. Following the preparation of this report, Greek officials began to make efforts at reaching their goals and making Greeks the rulers of the city. With this aim, some Greek banks were established in Salonica during that period. Propaganda intended to keep the agricultural products of Greek farmers from being sold to Jewish commissioners was spread. The Harostis Thessalonikis newspaper, which was published by the Greeks of Salonica, included articles about the necessity of starting off an economic war against the Jews by the Greeks. Jews, on the other hand, formed a union called ‘Club des Intimes’ in order to oppose this Greece-sponsored campaign. Becoming worried about the possibility of the tensions between the communities resulting in a clash, the Turkish officials of the city prohibited the Greek newspapers from publishing articles that targeted Jews. 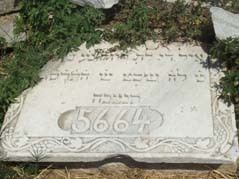 A Jewish tomb at Salonica Hortaci Mosque. With the explosion of the Balkan War in 1912, the atmosphere of peace and security atmosphere in the Balkan countries disappeared and nationalism based on racism and religious intolerance took its place. One of the groups that were harmed due to this situation was the Jews in Salonica. Immediately following the Greek invasion, the Greeks that made up one-third of the population of Salonica attempted to take violent acts against Jews and Turks. The actual incidents began with the entrance of first the Greek troops and then the Bulgarian troops into the city, after the Turkish commander of Salonica surrendered on November 9, 1912. Turning this situation into an opportunity, the Greeks displayed great fanaticism and began to attack Jewish and Turkish neighborhoods. The Greek troops, most of the time, acted along with the fanatic Greeks, instead of preventing the attacks. Over fifty women were raped. Four hundred stores and three hundred houses belonging to Jews were looted and those who resisted were killed. “The Jewish towns of Salonica, which were once in prosperity, are in absolute appearance of ruins. The mass migration of Jews from the city is continuing. It is impossible to see even a tiny sparkle of hope. Speculations about how this situation came about were mostly directed on the new rulers of the city” (May 29, 1914). Incidents that took place during the invasion caused international reactions from Jewish communities in other countries, as well. The committee that was established, jointly, by The Anglo-Jewish Association and German Hilfverein, as well as by Paul Nathan, Elkan Adler and Bernard Kahn, came to the region in January 1913 and determined the situation of the Jews on the spot. The committee indicated in its report that the situation in the lands under Greek invasion, especially in Salonica, was much worse than the situation under Serbian and Bulgarian control. The wide coverage of the pressures inflicted upon Jews by the Greeks by the world media caused certain powerful states, especially England and France, to attempt initiatives against the Greek government and to desire the ending of this situation. The Venizelos administration promptly made statements and took measures against actions aimed at Jews. Jewish prisoners of war and those who were held in prisons for no reason were released. Jewish tombs at next to Salonica Genderme School. During the years between 1912 and 1919, Greece followed a soft policy towards the Jews in order to gain the support of Jews who were especially dominant in the social, economic, and cultural life of Salonica. Around 70,000 – 75,000 Jews that lived in and near Salonica made up the social, economic, and political dynamics of the region. Although the Jews of Salonica did not, initially, reject the allegedly peaceful hand of Greece, they realized, in time, that such cooperation was to be against them. The autonomy of Greece over Salonica meant that the bonds between Jews and the Balkans would break apart. Also, on the other hand, this situation meant that Salonica was to become ‘Hellenic’, and, consequently, for the Jewish culture and existence to be ousted. The most significant incident that took place in Salonica during the years of the First World War was the fire that occurred on August 5, 1917 and destroyed, within a few hours, the Muslim and Jewish towns in the city completely. During this fire, which also caused the commercial centers of the city to perish, 52,000 Jews and 11,000 Turks lost their houses and work places. The real cause of the fire and how it spread so quickly is still not clear. Regardless of what caused the fire to start, events in its aftermath showed that this incident worked not on the side of the Jews but for the advantage of the Greeks. A week after the fire, the government made all of the areas damaged public and designed a plan to re-develop the city. However, under the framework of this plan, Jews and Muslims who were harmed in the fire did not receive equal rights when the new buildings were being constructed, and they were cast out of Salonica. The government purposefully slowed down the progress of Jews that wanted to rebuild their towns on their own. And all of this caused the tension between the government and the Jews to reach high levels. The Hellenization policy, which aimed to gain control in Salonica where Jews predominantly lived, sped up its pace after WWI ended, especially after Greek’s ‘Asia minor Expedition’ in 1922 resulted in defeat. The lives of the Jews in Greece, which were already inconvenient, became even more difficult when a great number of Greeks living in Turkey began to move to Greece as a result of an exchange agreement between Turkey and Greece. This new population was settled in the towns where Turks lived; and they became neighbors with Jews. The number of Greeks who moved to Salonica through this agreement was over 100,000 and this situation turned the population distribution of the city upside down. Although Jews had possessed an unchallenged superiority in commerce and handicrafts for centuries, they began to regress in the face of the newcomers, who, with the encouragement of the government, became active in the same sectors. The time period when the migrants from Anatolia settled in Salonica and nearby was also the years when Greeks were trying to heal the wounds they received in their defeat by the Turks. Those who looked for excuses for their unsuccessful outcome started to blame the Jews that took side with the Turks during the Anatolian resistance. Jews in Salonica also were subjected to these accusations. Under these circumstances, some decisions the Greek government made between the years 1924 and 1936 resulted in the exclusion of Jews from economic life. The increase of the customs tariffs on products coming from abroad limited the opportunities of cross-border trade for the Jews. The regulation that requested the set-up of the bazaar on Saturdays was a blow to Jews’ commercial affairs since they were not permitted to work on Saturdays, the sacred day. Furthermore, government’s favoritism towards Orthodox Greeks in the distribution of import licenses was another blow to Jews. Lastly, as the government placed the shipping companies from Pire into Salonica, Jews lost control over port regulations, which they had uninterruptedly managed for 400 years. On the political stage, the Greek government under the leadership of Venizelos put up barriers against the political empowerment of minorities and against their ability to send a representative to the parliament and form an active opposition by placing the Jews of Salonica and the Turks of Western Thrace in separate electoral districts. Empowered by Venizelos’ anti-Semitic policies, certain groups organized a great demonstration on June 29 1931 in Salonica. Nearly 2000 Greeks that participated in the demonstration headed towards Kampbell town in Salonica, where 220 Jewish families resided, and set numerous buildings on fire, including the synagogue, school, community center and the residencies of the rabbi and the doctor. The fire turned the centuries-old Jewish town into ashes in a very short period. Shortly after, a synagogue in the town of Harilaos, in Salonica, was also set on fire in July of 1931; and this was followed by an attack by Greek groups on the Jews of Sefardim in town #15. Those who attacked Jewish towns were tried before the courts. However, all of them were then set free. To avoid the spreading of the word about the actions against Jews to people in foreign lands, letters sent abroad by Jews in Greece were confiscated. A new era began in Greece in 1936 when Venizelos was removed from office, the republican government was dismantled, George II was crowned, and the monarchy was re-established. During the dictatorial administration of Prime Minister Metaxas, Jews achieved a somewhat eased situation. However, with the start of WWII, one of the most painful pages in the history of Jews in Greece was opened. For the 56,000 Jews living Salonica, the actual negative events began when Greece was occupied by the Germans. Immediately after entering Salonica, as one of their first actions there, the Germans closed down all of the newspapers that Jews were publishing. Organizations of republican Jews were disbanded. On July 11, 1942, the general of the German troops in northern Greece, General von Krenzki, ordered all Jewish males in Salonica to gather in the city center. Jews were told they were to receive workers’ card in order to work. That day, around 10,000 Jews were beaten by German soldiers until the evening. The next day, they were sent to the swamps on the western side of the city. A majority of them got malaria there. When the Nazi SS commanders took over control in the German-occupied regions in February of 1943, Jews were sent to the camps. Areas that were vacated by the Jews were handed over to the Greeks by the Germans. In the month of 1942, the old Jewish cemetery, which had a history going back to the 15th century and had 50,000 gravestones, was expropriated. The major Jewish cemetery in Salonica was given to the control of the municipality with the excuse of the need to enlarge the university. In a short period, Greeks demolished this cemetery. The gravestones were broken down; and some of them were used in the construction of houses. Today, it is possible to see Jewish gravestones from those years placed as upholstery in the Agios Dimitrios church in Salonica and as roadblocks across from the university. Attacks on Jewish cemeteries have taken place again in recent years in various parts of Greece. Some of these incidents are as follows: Greek extremist nationalists destroying the Jewish cemetery in Trikala on March 18, 1997; an unidentified group entering the 3rd section of the Jewish cemetery in Egaleo, Athens on May 27, 2000 and drawing crosses with gamma designs and writing anti-Semitic slogans on gravestones and the Jewish Genocide Monument with spray paint; and the incident on October 18, 2003, during which the gravestones in the Jewish cemetery in Yanya were soiled and neo-Nazi slogans and crosses with gammas were written on them. Today, the population of the Jewish minority living in different parts of Greece is about 6,000. There are two reasons for the further decrease in the Jewish population, which was actually nearly 10,000 following the genocide of the WWII. One of them is due to Greek-Jews, just like many other Jews in various parts of the world, leaving the lands they lived in for hundreds of years and migrating to Israel after the state of Israel was established in 1948. The second and the more interesting reason is the fact that many Jewish people had to leave these lands due to the anti-Semitism that prevailed in Greece not only before the war but also in its aftermath. In 1997, a small Jewish school was opened in Salonica, where 1000 Jews live. In our day, this continues in the same way. In 2000, a group of Jews began to search for ways to retain the community’s wealth, which is worth $2.4 million. Neval Konus is an art historian.